The unpaid principal balance of this Note will bear interest from the date of this Note until payment in full at a per annum rate equal to _____ percent (___). All interest will be computed as a per diem charge for the actual number of days elapsed on the basis of a year consisting of three hundred sixty-five (365) or three hundred sixty-six (366) days, as the case may be. Provided no uncured default has occurred under this Note, the unpaid principal balance of this Note plus accrued interest thereon will be paid by the Borrower paying to the Lender twelve (12) blended quarterly installments of principal and interest equal to _________________ Dollars ($_________), commencing on ________, 20__, and on the _________ (__) day of each successive September, December, March and June thereafter through _________, 20__ (the "Maturity Date"). In the event of an adjustment, prepayment or set-off against the unpaid principal balance of this Note, the annual payment will be recalculated to the amount which would fully amortize the unpaid principal balance of this Note on such date, together with accrued interest thereon, over a term ending on the Maturity Date. Notwithstanding anything to the contrary, the entire unpaid principal balance of this Note and all accrued and unpaid interest will be due and payable on the Maturity Date. Each payment will be applied first to the payment of interest on the unpaid principal and the balance, if any, will be applied to the unpaid principal balance of this Note. The Borrower will have the right to prepay this Note in whole or in part at any time without premium or penalty, but with interest on the unpaid principal balance accrued to the date of prepayment. 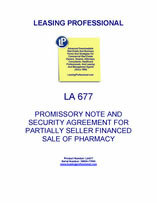 The Borrower and the Lender also agree that the Borrower’s obligations under this Note may be set-off against any amounts owing to the Borrower under that certain Pharmacy Purchase Agreement (the "Agreement") dated _______, 20__, among the Borrower, the Lender and affiliates of the Lender, subject to the limitations set forth in the Agreement. This Note is issued subject to the terms of the Agreement. The Borrower agrees that if, and as often as, this Note is placed in the hands of an attorney for collection or to defend or enforce any of the holder’s rights hereunder or under any instrument securing payment of the same, the Borrower will pay to such holder its reasonable attorneys’ fees and all expenses incurred in connection therewith. This Note is to be construed according to the laws of the State of ___________. THIS SECURITY AGREEMENT is executed effective _________, 20__, by PHARMACY BUYER, LLC, a ___________ limited liability company (the "Borrower"), in favor of PHARMACY COMPANY, INC., a ___________ corporation (the "Lender"). (d) customer files and customer records whether paper files, computer data or EMR (Electronic Medical Records). (b) the obligations of the Borrower to the Lender under this Agreement. 3.1. Location. The Borrower is a limited liability company duly formed and in good standing in the State of ___________. 3.2. Title. The Borrower has absolute title to the Property free and clear of all liens, encumbrances and security interests except for the security interest hereby granted to the Lender, and the Borrower warrants and will defend the same unto the Lender against the claims and demands of all persons and parties whomsoever. 3.3. Lender Security Interest. This Agreement creates a valid and binding security interest in the Property securing the Secured Indebtedness. There are no consents required in connection with the grant by the Borrower of the security interests in the Property. The Borrower has good right and lawful authority to pledge the Property in the manner hereby done or contemplated. All filings and other actions necessary or appropriate to perfect or protect such security interest will be or have been duly taken. 3.4. Inspection. The Lender may from time to time, upon request, inspect all of the Borrower’s records concerning any of the Property. 3.5. Financing Statement. The Lender is authorized to file a financing statement covering the Property. 3.6. Notifications. The Borrower will immediately notify the Lender of any change in the Borrower’s name or identity. In any notice furnished pursuant to this paragraph 3.6, the Borrower will expressly state that the notice is required by this Agreement and contains facts that will or may require additional filings of financing statements or other notices for the purpose of continuing perfection of the Lender’s security interest in the Property. 4. Lender Expenditures. If the Borrower fails to make any expenditure or pay any sum necessary to discharge any lien, encumbrance, levy, security interest or other charge on the Property as required hereby, the Lender may, but will not be required to, make any expenditure for such purpose or purposes and all sums so expended shall be payable on demand, shall bear interest at the rate specified in the Note and all such sums and interest will additionally be secured hereby. The Borrower will pay all costs of filing any financing, continuation or termination statements with respect to the security interest granted hereby in the Property.